It produces a "laminar" flow of air using the Coanda effect. This draws a large volume of air from the surrounding area along with the small amount of compressed air from the Air-Blade. It also produces an output flow up to 40 times. Made of a coated Aluminum body and hard coated cap. Compressed air enters the air knife at the rear (or end) ports at (A). Air is entrained at point (B) and (D) by the compressed air stream that leaves the air knife from a small gap at point (C). 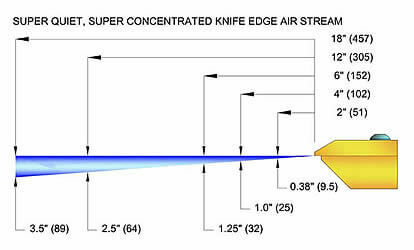 The entrained air follows the profile that directs the airflow in a perfectly straight line to create a uniform sheet of air along the entire length of the Air Blade™ air knife. The amplified air stream maximized velocity and force are maximized as a well-defined sheet of laminar flow with minimal wind shear for reduced energy use in the blow off and cooling. This one piece kit c/w 10 stainless steel screws connects any two Silent X-Stream Air Blade Air Knife of 6" or larger together to make a longer blowoff system to cover greater distances. The units come in three models. Model 10900X gold anodized aluminum for the gold anodized aluminum Silent X-Stream Air Blade Air Knives, Model 10900XHA for the Hard Anodized units, and Model 10900XS stainless for stainless steel models. Mounting and holding systems are available for the Standard Air Blade Air Knife. Fully flexible positioning. It produces a ?laminar" flow of air using the Coanda effect. This draws a large volume of air from the surrounding area along with the small amount of compressed air from the Air-Blade. It also produces an output flow up to 40 times.